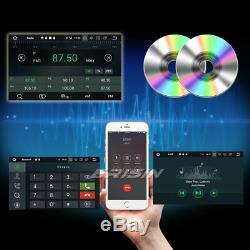 DAB+Autoradio DVD GPS Bluetooth 3G Opel Corsa C/D Zafira Astra H Vectra C Signum 3G TNT-IN. 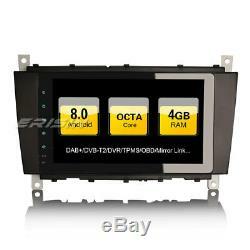 Octa core Android 8.0 Autoradio Navi DAB+GPS 4G TNT for AUDI A3 S3 RS3 RNSE-PU Vito Viano. DAB+ Autoradio for Mercedes Benz C/G/CLK W203 W209 Viano W639 Android 8.0 NAVI. This unit is the best android car multimedia system on the market, 8-Core with high-speed processing, the most functions can be compared with your smartphone. The newest 8 All-in-One Design for Mercedes BENZ C-Class W203 CLK Class W209... Cars with Flat Frontpanel and Pure Touch-Buttons. (it cost GBP30 in the market). Adopt the newest Android 8.0 Oreo OS, 1024600 HD Capacitive Touch Screen, Octa Core 1512MHz CPU, 4GB RAM and 32GB Internal Storage, Support extended 1 Card/2 USB Stick up to 332GB. 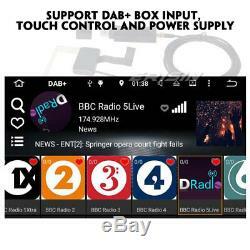 Built-in DAB+ App, just connect with our DAB+ Box to use this function. Built-in TPMS App for display Tire Pressure Monitoring System, just connect with our TPMS product through USB to use this function, and built-in DVR App, just connect with a USB Camera to use Car Record function. The records will be saved in Card/USB Storage automatically, and you can play saved record on this unit directly. 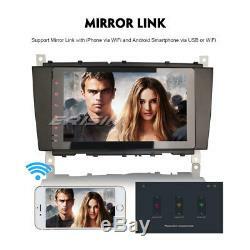 Support Mirror Link for iPhone and Android SmartPhone. Support Torque Pro (OBD2 & Car), you can connect a ELM327 Bluetooth OBD2 Scanner Tool to use this function. Most popular and strongest function. Support 1080P Videos/live images/2160P Photos, support PDF/WORD/TXT/EXCEL, Audio/Video/Photo media Player, surf Internet through 3G/4G or WiFi, support Google online maps and Free Android offline maps GPS Navi, get access to thousands of apps, games on the Google Play Store, keep connected through Twitter, Facebook, Gtalk, Gmail, WeChat, Skype and other services, play popular games like Fruit Ninja, Feed the Candy, Angry Birds, Big Fish, Air Attack... Radio, RDS, Bluetooth, USB, SD, CAM-IN, AUX, Steering Wheel Control, 8 Panel Light Colors and via RGB Combination, Live Wallpaper, DIY Wallpaper. This unit will fit the following car model. (C180 C200 C220 C230 C240 C250 C270 C280 C300 C320 C350 C32 AMG C55 AMG C63 AMG). (CLK200 CLK220 CLK240 CLK270 CLK280 CLK320 CLK350 CLK430 CLK500 CLK550 CLK55 AMG CLK63 AMG). If your W209 car's radio is similar with this item, but its front panel size has only 254mm120mm238mm (X), this item will not fit your car. If this unit can not fit your older BENZ C/CLK car, please find the other item ES7489 in our shop. Operation System, Beautiful and fashionable UI Unique Design. The newest 8 Inch super wide Screen and Pure Touch-Buttons---our unique design. Support Split Screen , you can run two apps side by side. Industrial-grade Chips, 1512MHz Cortex A53 CPU. Internal Memory, support extended Media Card/GPS Card/3 USB Stick up to 332GB. Built-In Clock and Calendar, Clock/Date/Week/Time Zone adjustable, can use GPS or network-provided time. Multi-Languages: it has more than 180 languages to select, just check it in our pictures. 8 Panel light colors, and you can setup hundreds of colors via RGB Combination. 5 live wallpapers, 12 wallpapers, support DIY User's wallpaper from Gallery Pictures. 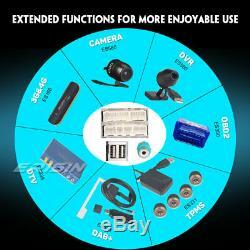 Support Bluetooth hands-free function , built-in microphone and external microphone Jack. Torque Pro (OBD2 & Car). You can connect a ELM327 Bluetooth OBD2 Scanner Tool to use this function. With iPhone via WiFi and with Android Smartphone via USB or WiFi. USB Port and Micro SD Slot, Support USB Stick and Memory Card up to 32GB. Just connect with a USB Camera to use Car Record function. The records will be saved automatically in Nand Flash/GPS Card/SD Card/USB Storage and you can play saved record on this unit directly. 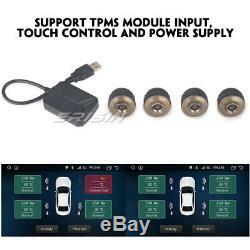 Built-in TPMS System, just connect with a TPMS product through USB to use this function. System, just connect a DAB/DAB+ Box with USB Port to use this function. Support RCA Audio & Video Input, you can connect a. Digital TV Box (DVB-T/T2, ATSC, ISDB). 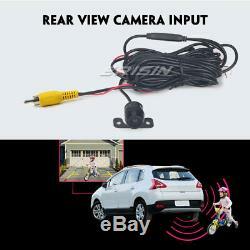 Support Rear View Camera input and reverse trigger Control. Support Steering Wheel Control , Hand Brake Control. Electronic Anti-Shock, Last Position Memory. 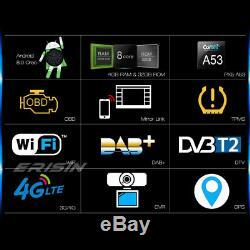 ES7483C 8 Octa-Core Capacitive Android 8.0 Car Multimedia Player GPS/WiFi/TPMS/DVR/DAB+... General - Power Supply: DC 12V (allowance range: 10.8-14.5V) - Max. ASF, TS, TP, 3GP, MPG ect. =30 formats, Playing internet video directly (while downloading) - Play: Up to 19201080 Pixels, 30Mb. Fluent play without light spot - Video Output: Common Video Output (AV) GPS - Operation System: Android 8.0 - Support Maps: IGO, SYGIC maps for Android 8.0 - Ready to use: Yes - Voice Guidance: Yes - Support 2D/3D Map Views: Yes - Dual Zone: Yes, navigating while music playing - Online Navi: Yes, support google maps online navigating Bluetooth - Hands Free: Yes - A2DP (Bluetooth Stereo Music): Yes, can play stereo music through Bluetooth - Bluetooth Music Control: Yes, play/pause/previous/next - PB-Download: Yes, can download phonebook from mobile to this unit - PB-Search: Yes, can use the first letter to search contact member in PB-Listings - Calling Records: Yes, Dialed Call, Received Call, Missed Call - Setup: Auto Answer, Auto connect, Device name - Built-in Microphone: Yes, on the front panel - External Microphone Jack: Yes, on the back, external Mic. Play by revolve, Powerpoint Support 40964096 Pixels - Wallpapers: 5 live wallpapers, 12 standard wallpapers, support DIY wallpaper from Gallery - APK Installer: Support Android Package installer - Support Split Screen, you can run two apps side by side - Support Torque Pro(OBD2 &Car): Yes, you can connect a Bluetooth OBD2 Scanner Tool to use this function - Support Mirror Link function: Yes, support screen mirroring from iphone and Android Smartphone Setup - Network & Internet: WiFi/Hotspot/VPN/Airplane mode - Connected devices: Bluetooth settings and connecting - Apps & notifications: Apps Info/Notifications/App permissions/Default apps, Special app access - Display: Brightness level, Wallpaper, Font Size, Night display and Touch Assistive - Wallpaper: Wallpapers, Live Wallpapers, Gallery - Sound: Key Tone, Volumes, Default notification sound, Default alarm sound - Storage: Storage manager, Internal shared storage and Portable Storage - Security & Location: :Location/Device admin apps/Apps with usage access - Users & accounts: Add account/Automatically sync data - Accessibility: Yes - Car settings: Element/Steering wheel keys/Amplifier/Navigations/Driving settings/Extra settings/ Factory settings - Element: 8 Panel light colors, support RGB Combination - Amplifier: Rock/Pop/Jazz/Classic/Flat/Voice/Custom - Navigation: Yes, Navigation application options, monitoring, sound mode, mixing ratio, GPS monitor - Driving safety: Allowed or block Watching video, Notifications in statusbar while driving. Input - AUX Video In: One - Rear-View Camera Video In: One - External Microphone In: One - AUX Audio In: R/L - DAB+ Box In: One - Car DVR In: One - Radio Antenna In: One - GPS Antenna In: One - WiFi Antenna In: One Output - Video Out: Two - Audio Out: FR/FL/RR/RL - Surround Stereo Out: 445w - Subwoofer Out: One Accessories - 1User's Manual in English - 1RCA AV Output Cable - 1RCA AV Input Cable - 1Radio Antenna Adapter Cable - 1Power Cable with Quadlock Harness - 1Special CanBus Decoder Box - 1External microphone Cable - 1Back USB1 Adapter Cable - 1Back USB2 Adapter Cable - 1GPS Antenna - 1WiFi Antenna. Nous livrons dans le pays suivant SEULEMENT: Europe Pays de l'Union (Canarias, Réunion, Martinique, Guadeloupe, la Bolivie française et ainsi sur les îles EXCLUS). L'expédition sera organisé à partir du Hong Kong. Pas de service Pick-up local. Listing and template services provided by inkFrog. 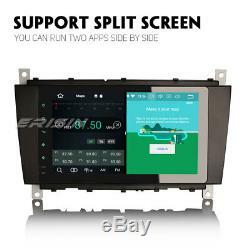 L'item "DAB+ Autoradio for Mercedes Benz C/G/CLK W203 W209 Viano W639 Android 8.0 NAVI" est en vente depuis le jeudi 31 mai 2018. Il est dans la catégorie "Auto, moto pièces, accessoires\Auto\ pièces détachées\Autres". Le vendeur est "erisincaraudio" et est localisé à/en 1 Year EU-warranty.